As technology continues to dominate our lives way more than it should, the way of life is changing with everything gradually moving towards modernism. This has taken a toll on the traditional art forms and practices and age-old way of living. They are probably the ones who face the harshest of consequences. One such story is of copper’s equally lustrous counterpart – Brass. The shine and gleam of this metal are slowly fading away due to the intrusion of the modern ways coming into the place like the nonstick cookware, stainless steel, and other refined alternatives. Not to mention, along with the declining usage of these time-honored metals like brass and copper, the traditional craftspeople who have been involved with the making and development of these are disappearing as well. – According to Ayurveda, the usage of Bhasmas or ashes of precious herbs, and metals and stones such as gold, silver promotes good health and well-being. The ancient Ayurveda also gives immense importance to the metals that our cooking utensils are made of. Old-school utensils like brass and copper are noted to hold therapeutic benefits, whether you use them for cooking, or to eat your meals. – It is also believed that the non-stick pans could even be detrimental to the health of your skin. Dr. Perumbuduri Naresh, the senior Ayurvedic physician at Ananda in the Himalayas, says that the chemicals that leech off these coated pans could lead to conditions like chronic acne. -Water stored in a brass vessel increases strength and immunity. In addition, it also helps pacify pitta (burning sensations, aggression), increases hemoglobin count, and improves the general condition of your skin. What’s more, it will not change the qualities of the material that is placed in the container. 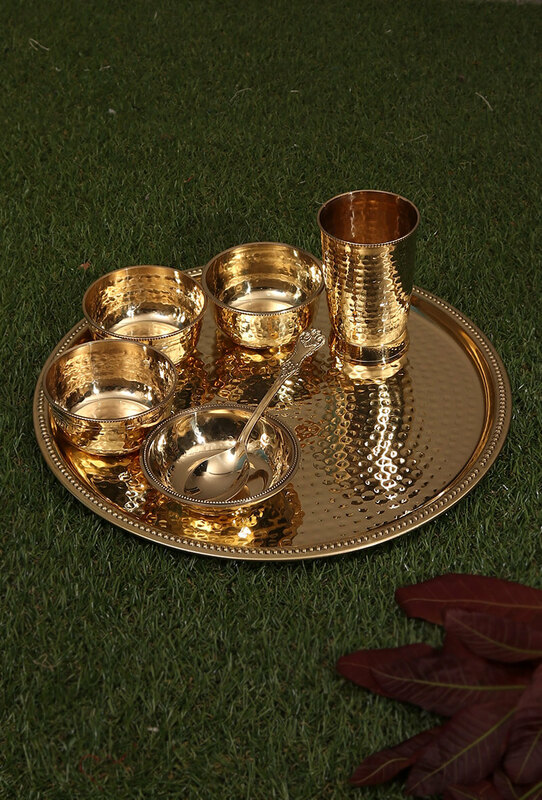 – Kalaiwalas (who tin the copper and brass utensils) believe that stainless steel should only be used for boiling milk or water but if you want the food to taste better and taste to linger in your mouth, then go for brass utensils. The food tastes so much better when cooked in a brass utensil. 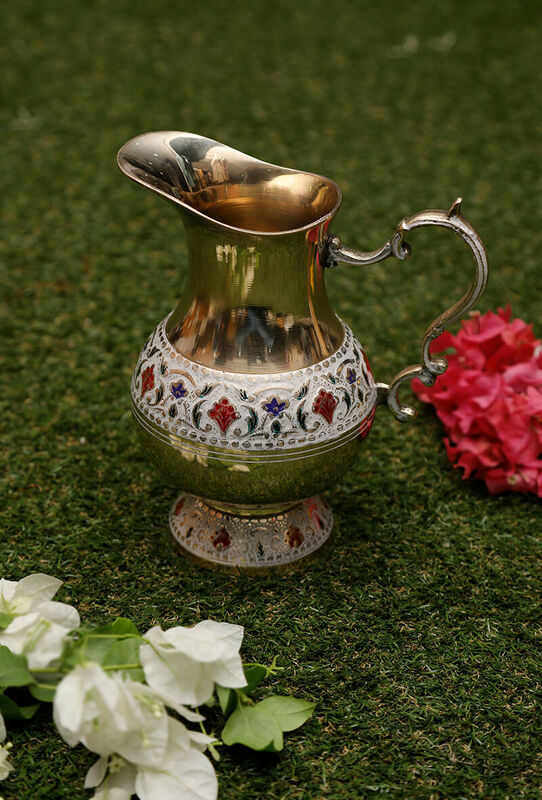 Handcrafted entirely in brass, this water jug flaunts intricate motifs around its center, hand-painted by skilled Indian artisans. Ideal for serving, this water jug adds a unique charm to your dining table. 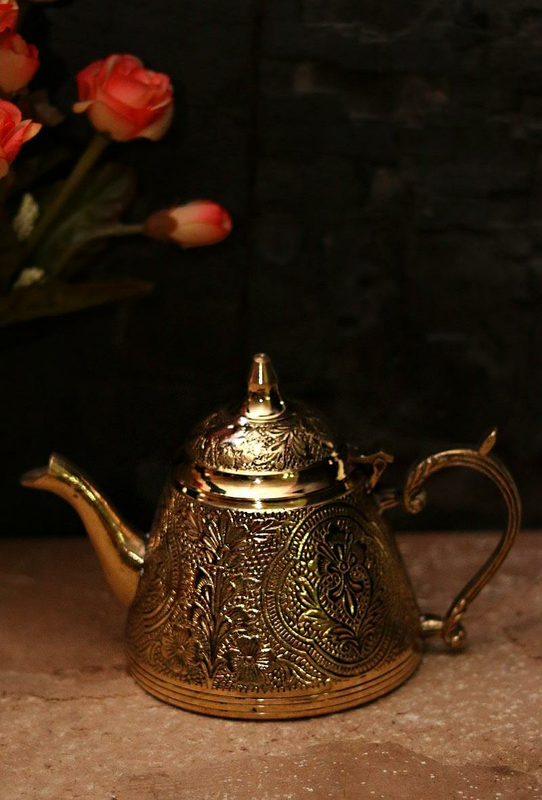 This small kettle has been crafted entirely by hand in sturdy brass. The carvings ingrained in the kettle have also been carved by hand. The brass adds medicinal properties to the kettle.